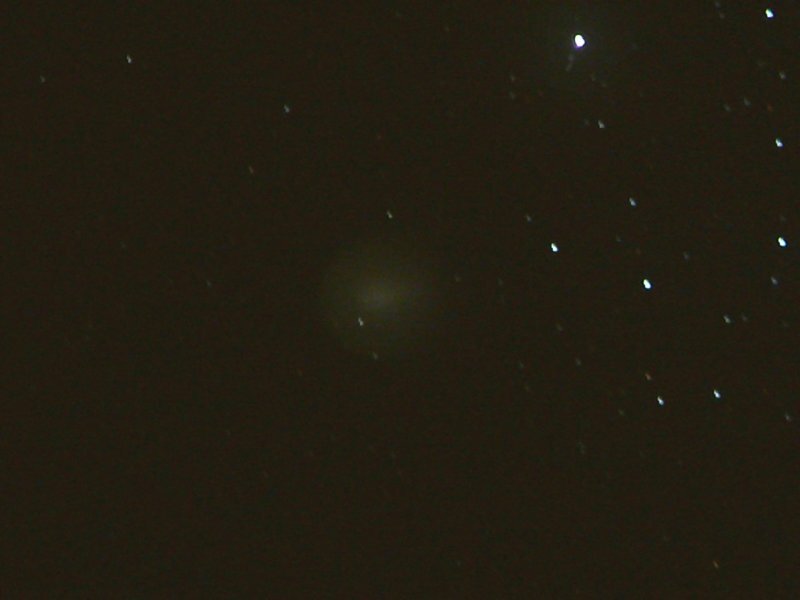 Here is an enlarged view of Comet Holmes. On October 24, 2007, periodic Comet Holmes (17P) brightened dramatically — by nearly a million times — virtually overnight. For no apparent reason, the comet erupted from a very dim magnitude 17 to about magnitude 2½. Within a day its starlike nucleus had expanded into a perfectly round, bright little disk visible in binoculars and telescopes. It looked like no comet ever seen (citation from Sky & Telescope Magazine). Taken with Panasonic DMC-TZ1, f/4.2, 60s exposure time, 52mm (350mm equivalent on 35 mm camera) in combination with 2x digital zoom, ISO-80. Taken on 11-13-2007.